"It is important that we explore ideas for climate change mitigation that can supplement the effects of decreasing carbon emissions," said David Emerson, a senior research scientist at Bigelow Laboratory for Ocean Sciences and author of the paper. "The more ideas we test, the better decisions we can make for our planet's future." Emerson's paper proposes a novel way to provide iron to large areas of the ocean, 30 percent of which is poor in the essential element. This method takes advantage of minerals synthesized by iron-oxidizing bacteria, which feed on the tiny spark of energy they generate by transferring electrons between iron and oxygen. This process produces rust minerals as byproducts, which are of the right chemical composition to be used by the tiny ocean plants called phytoplankton that help remove carbon dioxide from the atmosphere. Iron-oxidizing bacteria live in environments as extreme as the deep ocean and as common as roadside ditches. Emerson believes that cultivating iron-oxidizing bacteria in shallow ponds could be a simple, inexpensive way to produce nanoparticles of iron that have specific properties needed to "fertilize" the ocean. Using iron fertilization as a climate change mitigation tool was first proposed in the 1990s, and Emerson believes implementing a controlled research program is the next step in exploring its efficacy. 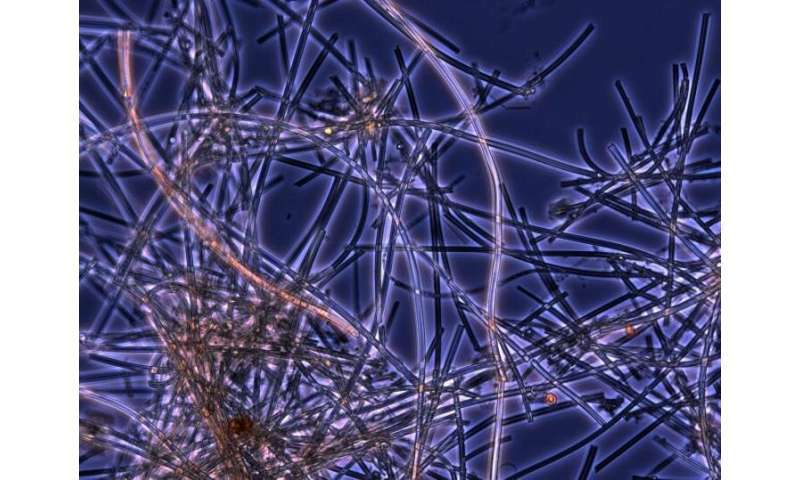 "This research has tremendous potential to integrate disciplines from phytoplankton ecology, to atmospheric science, to engineering," Emerson said. "At minimum, we would gain a better sense of how the ocean works. At best, iron additions would act on a short time scale to help mitigate climate change." Most iron enters the ocean as dust that blows seaward from the Sahara and other major deserts. Emerson believes that using aircraft to distribute a fine iron powder over deficient ocean regions would approximate natural iron inputs. Timing flights with seasonal phytoplankton "blooms" would stimulate growth and boost populations. "In addition to cutting carbon emissions, we need to remove more carbon from the atmosphere to limit global climate change," Emerson said. "These geoengineering approaches are not solutions to the whole problem, but they are potential ways we can mitigate the worst effects." "It's important to start investing in thoughtful and extensive research programs now," Emerson said. "The worst thing would be if, in several decades, people faced with horrible consequences of climate change started taking dramatic action without understanding the long-term effects. We need to explore and develop a continuum of solutions, from actions we can take as individuals to large-scale efforts."